Pit-Klamath brook lamprey adult (top) & ammocoete (bottom). Location: Dry Creek, Lake County, Oregon. Date: 9/18/2007. Photo by Michael P. Heck, Oregon Department of Fish and Wildlife. Pit-Klamath brook lamprey in Lassen Creek (Goose Lake), Modoc County, CA on 3 June 2009. Each lamprey is holding on to the rock using its oral disc. Photo by Steve Howard. Note: There is a chance that the lampreys in the photo above are dwarf Pacific Lamprey, which are also present in Goose Lake. The two species are very similar, and you would need to compare the oral discs and plates to tell them apart. Pit-Klamath brook lamprey ammocoete. Date: 7/10/2007. Pit-Klamath brook lamprey ammocoete head. Date: 7/10/2007. 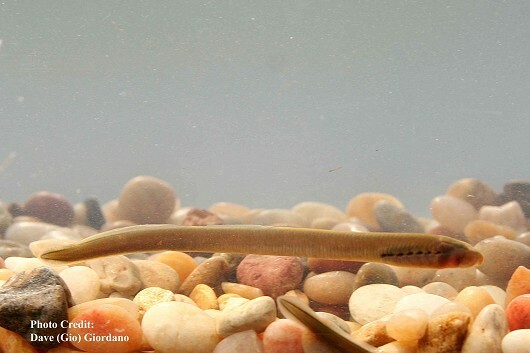 The Pit-Klamath Brook Lamprey is a non-predatory lamprey that is closely related to the predatory Pacific Lamprey, and often shares habitat with trout, Marbled Sculpins, Rough Sculpins, and Speckled Dace. Pit-Klamath Brook Lampreys are found within the Pit River drainage and the upper Klamath River upstream of the Klamath lakes. They are typically found in cool, clear, low gradient streams with sandy or muddy edges and bottoms. 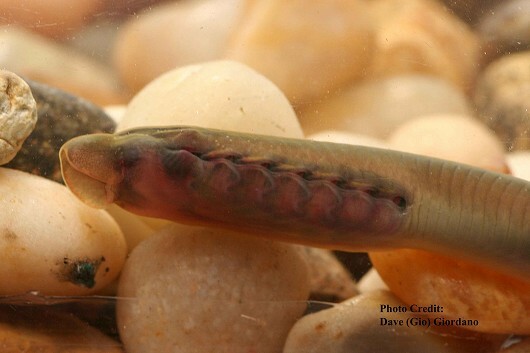 The larval lampreys or ammocoetes burrow tail first into the soft substrate where they feed on algae and detritus. The ammocoetes often burrow into areas covered by aquatic vegetation. 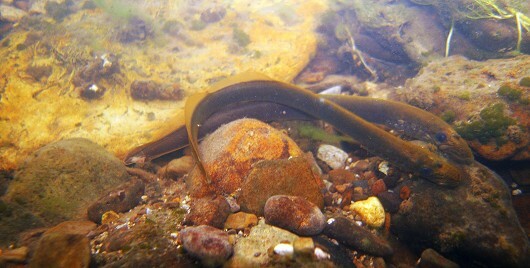 After at least 4 years the ammocoetes metamorphose into the adult lamprey form, probably in the autumn. Spawning begins in the spring and may continue into the summer.